A large nature reserve created as part of the Medmerry Managed Realignment Scheme is once again helping rare British wildlife to flourish this spring time. Avocets are breeding at the RSPB managed Medmerry nature reserve for the third consecutive year since the scheme was completed in November 2013. RSPB Medmerry was created as part of the multi-award winning Medmerry Managed Realignment Scheme, at Selsey in West Sussex. The scheme, carried out by Mackley working as part of Team Van Oord and on behalf of the Environment Agency, includes the largest realignment of open coast in the UK. Medmerry, which is located between Selsey and Bracklesham in West Sussex, is one of the stretches of coastline most at risk of flooding in southern England. The scheme is a key element in a 15-year project to provide 7km of new sea defences to protect local communities in the area. Around 24 pairs of the graceful black and white birds, classed as extinct in the UK until 1941, have nested in the reserve’s stilt pools, an area growing in popularity for the protected species. Medmerry is home to the only known breeding population of avocets in West Sussex, with each pair laying between two and four eggs. This year’s collection of long legged chicks have already started emerging. 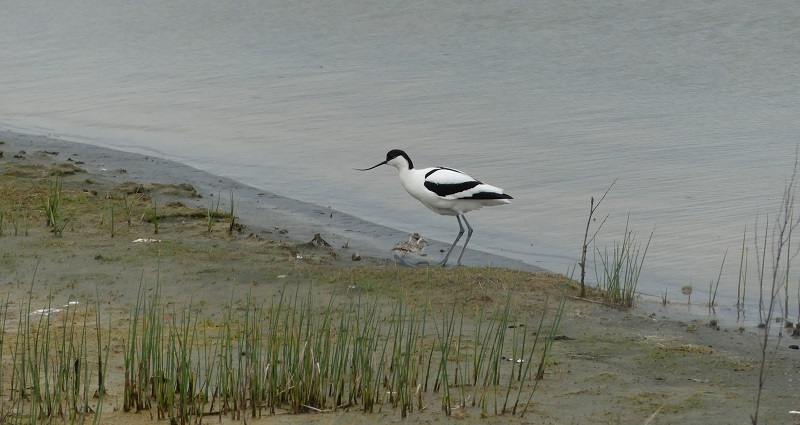 Avocets first bred at RSPB Medmerry in 2014, with eight pairs taking advantage of the newly created wetland habitat. In 2015 a further 18 pairs nested. Having bred successfully, avocets are said to be faithful to a site in subsequent years, so it is likely that at least some of the pairs are returning guests.